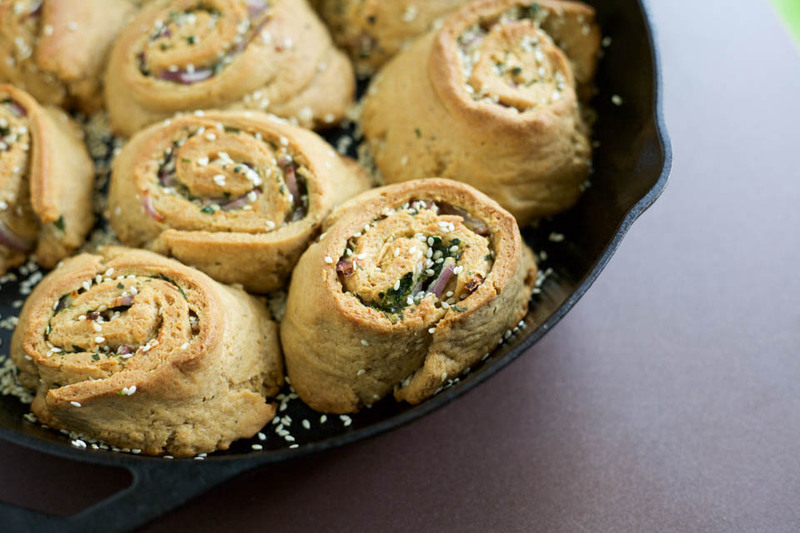 These super fluffy Savory Onion Sesame Parmesan Buns are awesome for a savory breakfast and made with whole wheat pastry flour for an earthy and touch healthier roll. Bake and enjoy all weekend! I’ve taken my cinnamon roll recipe and turned it upside down and came out with these Savory Onion Sesame Parmesan Buns, they are crazy good! They remind me of pizza in an weird and tasty way. I stuffed this whole wheat dough with parmegiano regianno, sliced red onions, fresh chopped parsley, and sesame seeds, maybe that’s why :). What I do know is that no one could keep themselves from eating them. I see that as a good sign. Even my Mama, who does not enjoy onions, ate the whole bun. She picked out the onions as she went, but ate it all nonetheless. 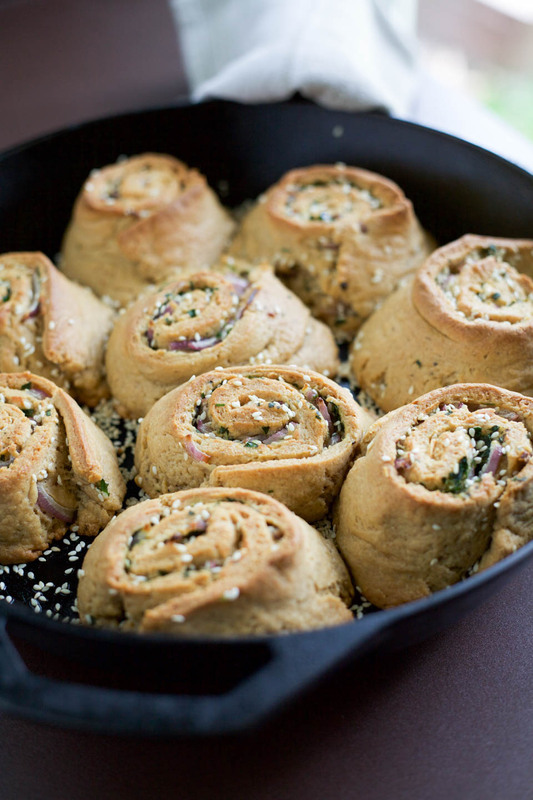 It’s a great savory breakfast, an awesome weekend baking project to make and enjoy. I ate one on it’s own with a cup of coffee, so good. Then with a nice huge salad, also super tasty. As for dinner, if you’re going to serve them as the dinner roll, I’d make them smaller. That way they can be enjoyed as an accompaniment with salad and dinner. In a bowl or liquid measuring cup combine yeast, 1/2 teaspoon honey, and 1/4 cup water. Stir to combine, let sit until foamy, about 5 minutes. Add buttermilk, egg, salt, and pepper, using a fork whisk until combined well. 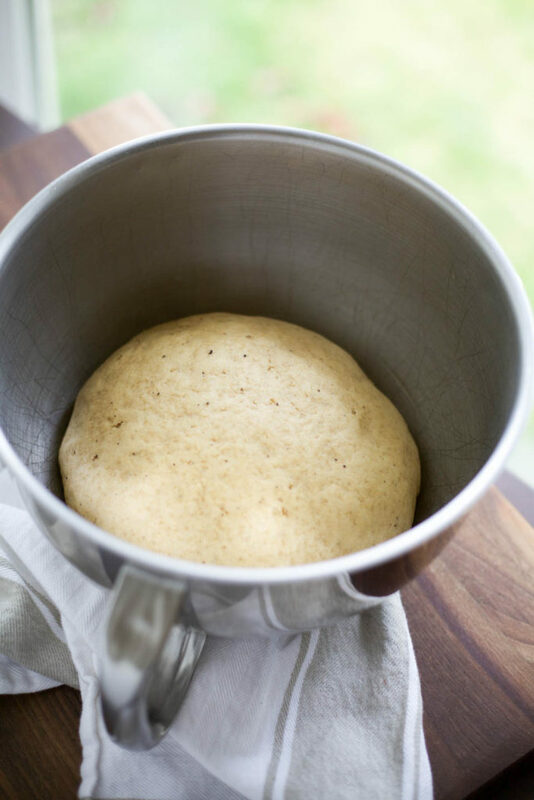 Add yeast mixture and flour to the bowl of a standing mixer fitted with dough hook. Turn mixer on to medium for 4 minutes. Add the butter, and mix until dough is smooth and pulls away from the side of the bowl, about 6 minutes. Remove bowl from mixer, cover with plastic wrap or clean dish towel, set aside in a warm place. Let the dough rise for 1 hour, until it has doubled in size. Tip: turn oven on it’s lowest setting for 15 minutes, turn off, and place the mixer bowl with dough in it until it doubles in size. Gently remove the dough from the bowl onto a lightly floured counter. Knead the dough for about 1 minute, folding it over on itself. Using rolling pin, roll the dough into a 10 x 20 rectangle. Brush to melted butter/oil mixture on the dough. 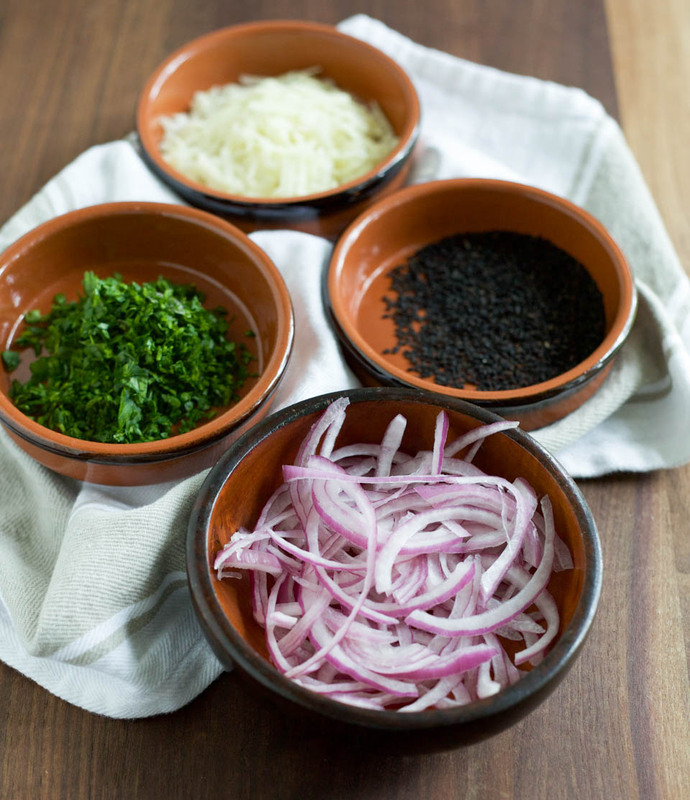 Sprinkle cheese, onions, parsley, and one tablespoon sesame seeds evenly on butter. Roll dough up fairly tightly. Preheat oven to 375 degrees while the rolls rise. Uncover the rolls. (If refrigerated, let them sit at room temperature for 15 minutes. )Sprinkle tops with 1 tablespoon sesame seeds. Bake for about 25-30 minutes, or golden brown. Remove from oven and allow to cool 5 minutes before serving. Store in an airtight container for up to 3 days in fridge, warm up to serve. Brush tops with olive oil when warm out of the oven for extra shine and flavor. 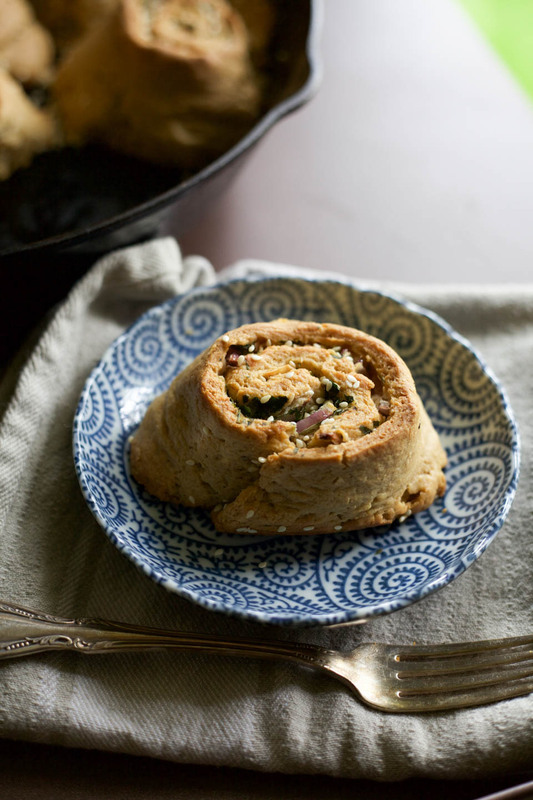 I love the idea of a savory roll at breakfast. So often everything is so sweet! Thank you! I totally agree :).